At the Department of Family Medicine we are committed to preparing each of our medical students residents for the broad challenges of family medicine, today and tomorrow. Our mission is to to provide high- quality patient care; support research initiatives; and equip physicians with the required competencies. Our department is internationally recognized for its community-based and primary care research programs. 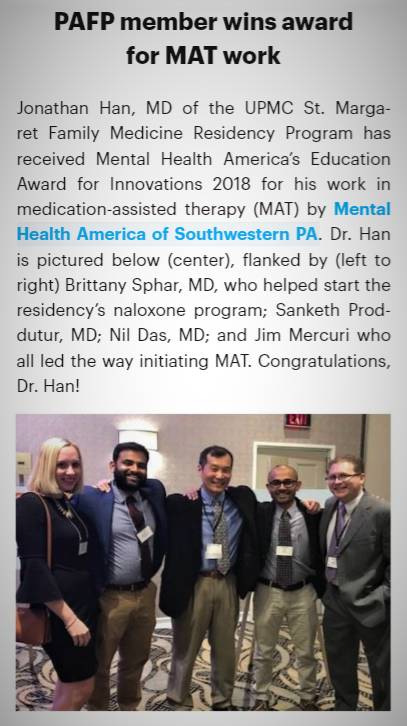 Mental Health America's Education Award for Innovations 2018!! See the link to Keystone Physician here! The Family Medicine Interest Group (FMIG) at the University of Pittsburgh School of Medicine were selected to receive the 2018 Award of Excellence for Innovative Programming at the AAFP National Conference in Kansas City in August. This group promotes advocacy, service, and education regarding current issues and topics in family medicine. As co-coordinators during the 2018-18 academic year, Elise Pearson and Sarah Minney (both Class of 2020) set out to increase the visibility of Family Medicine at Pitt Med, emphasize community involvement and service, and create engaging learning opportunities in primary care topics for all interested students. The FMIG initiatives included connections with local organizations to offer blood pressure and blood sugar screenings at health fairs, a fundraiser and day of service benefiting a local food pantry, a Family Medicine mixer event for students to meet family medicine physicians in an informal setting, and participating in the creation of a 5-session mini-elective for students entitled “Transitions: Primary Care’s Role in Addiction Medicine”. View the article in the Keystone Physician Magazine here!